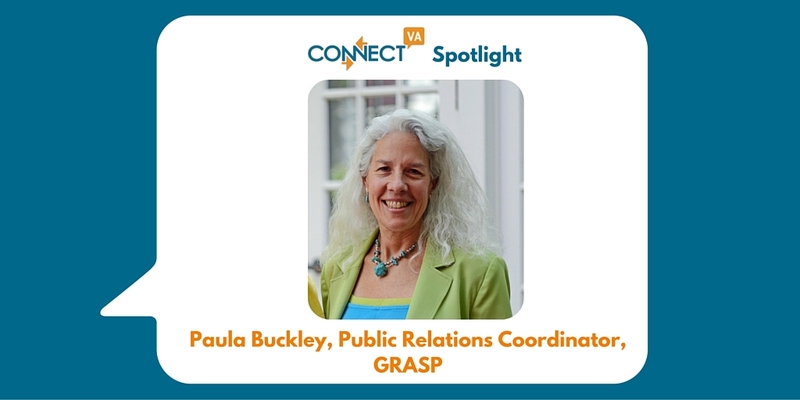 My name is Paula Buckley, and I work at GRASP (GRreat Aspirations Scholarship Program, Inc.), a non-profit, college and career access organization, as the Public Relations coordinator and as an advisor at Franklin Military Academy and Northstar Academy. In my earlier life, I served as a United States Marine Corps officer for 20 years, working initially in the financial management area and then in the public affairs field. GRASP’s goal is to ensure that every student has an equal opportunity for continuing education after high school, regardless of financial or social circumstances. GRASP advisors work in 76 schools in Virginia. In my advisor role, I work with students on the financial aid process for education after high school, which includes completing the FAFSA (Free Application for Federal Student Aid), researching and applying for scholarships, and reviewing financial aid award letters to determine the cost to attend various schools. Understanding this process helps students with the financial requirements when making their school selections. In my Public Relations role, I am always looking for ways to let folks know about GRASP and the free assistance we provide to students. Helping students/families that may not be familiar with the financial aid process get through FAFSA completion and then move on to the next level of education is incredibly rewarding. It is especially exciting to cross paths with former students who have continued their education after high school and hear them mention that the GRASP assistance they received was helpful. Major challenges include getting the word to students that continuing your education in some manner after high school is essential for better job and career opportunities, that completing the FAFSA is important, and that there are many affordable options for continuing your education after high school. We recently had a video made that relates to students and conveys the importance of talking to a GRASP advisor who can provide valuable information that can help you achieve your goals. Helping folks with the FAFSA is a key aspect of our program. This year, besides our two Saturday at the Library events at the Richmond Public Main Library (Jan. 30 and Feb. 27), we have been hosting a few more FAFSA events at libraries and community centers on weekday evenings to provide additional opportunities for students/families to complete the FAFSA since the FAFSA is the basis schools use to determine a student’s financial aid package. We have used ConnectVA to advertise our community FAFSA events and our annual GRASP Reach for the Stars Gala (the next will be Oct. 7), to advertise employment opportunities, and to find other opportunities for GRASP (i.e., potential grants, events to attend, etc.) ConnectVA provides a wealth of information, and I read all of daily updates! I love working for GRASP because I realize the importance of education after high school, and through GRASP, I am able to help people learn that there are affordable educational opportunities available to ALL students!